“We emphasize that the government should select whether to cast away its existence by selecting SAITM or save itself by abolishing SAITM. Why does it take so much trouble to protect SAITM when even its existence is at risk? We of the JVP shall rally all people’s forces to protect free education and against privatization of education. The fraudulent SAITM cannot be allowed to exist for ever. 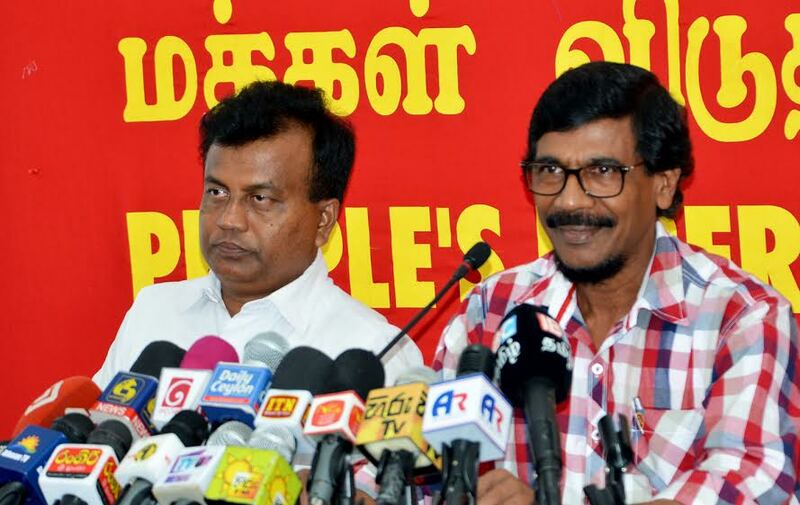 If the government doesn’t abolish SAITM we would abolish it by a people’s administration,” says the General Secretary of the JVP Tilvin Silva. He said this at a press conference held at the head office of the JVP at Pelawatta today (18th). The Member of the Central Committee of the JVP Attorney at Law Sunil Watagala was also present. Speaking further Mr. Tilvin Silva said, The government deployed police to brutally attack the protest march carried out by students yesterday (17th) demanding the government to abolish SAITM. University students held this protest campaign for a very justifiable grievance. The government, instead of listening to this justifiable demand carried out brutal baton charges and tear gas attacks. Students were pursued along roads to attack them. Even students who moved away from roads were attacked. The students marched not to fight with the government or the police. Theirs was a very justifiable cause. The government, instead of finding solutions for students’ issues attacked students like criminals. About 20 students were injured and about 10 students have been remanded. We vehemently condemn deploying police to attack the students and demand the government to unconditionally release all students who have been remanded immediately. Protests have been launched demanding to abolish SAITM and not to abolish free education. Political parties including the JVP, trade unions, students, doctors and parents carry out a struggle demanding to abolish SAITM as it is an illegal institute. The government, instead of listening to the people, is engaged in an attempt to protect the illegal institute. It attempts to crush people’s opposition by suppression. We ask to abolish SAITM not because we have an issue with that institute. SAITM is maintained as a step to abolish free education and sell education. It is not an isolated issue. That’s why it should be defeated. Certain sections of the government are coming out with various arguments to protect SAITM. When education in a country is privatized the consequences are very severe. Majority in our country lives with relief from the government. The daily income of the majority in the country is less than US$2. Many in our country cannot afford to spend Rs.120 – 125 for the education of their children. As such, this government is playing with the future of this country. We have come across incidents that have taken place due to private education. A youth was arrested by police for robbing a bank. Investigations showed that he was a medical student of a private university in Russia. A student who could have become a doctor had become a criminal due to poverty. Also, female students who study in private institutes in Europe advertise to sell their bodies. If students have to peddle drugs, sell their bodies or rob banks to pay for their studies we would have not doctors but criminals. This is why we demand the government not to abolish free education. However, the government’s response is arbitrary and despotic. This is a struggle of the people. Agitations are carried out using the freedom of expression of the people established constitutionally as the government doesn’t listen to the issue. The inhuman government deploys police to brutally attack students who make use of this ‘freedom’. The government’s aim is to protect illegal SAITM institute. SAITM is an illegal boutique maintained by lying to parents, students and with frauds. Now, advertisements are published spending millions to spread lies. They lie stating they have got the approval of Sri Lanka Medical Council and has got legal status. This institute is also connected with undemocratic acts. A person called Sameera, who held a responsible position in the institute got some people to shoot him. Even after the incident was proved to be a play act no action has been taken by the government against him or the SAITM owners. Also, a grenade attack was carried out against Sri Lanka Medical Council. Those who work in SAITM are like underworld figures. It is an institute maintained with underworld, money and thuggery. This is why people demand the government to abolish SAITM. The government stays mum while masses, including political parties, students, doctors, parents, demand that SAITM should be abolished. The government should take steps to solve the issue without trampling the mandate and unleashing suppression. The government doesn’t like agitations. It is scared of agitations. We tell the government, if it is scared of agitations, to find solutions for the just demands of the people. People resort to agitations as the government does not listen to their just demands. No one likes to take to the streets to get baton charged or tear gassed. The government instead of finding solutions is trying to suppress opposition. Agitations cannot be carried out according to a time table or at a specific area. That is good for tele-dramas. The government tries to solve problems by getting injunction orders. This would trivialize judiciary as well. The government has lost its composure when people justly oppose its failure to find solutions for their issues. Ministers in our country act like they are in a lunatic asylum. The left hand doesn’t know what the right hand does. The ministers come out with contradictory statements. They have no interest in solving people’s issues. They mediate only to solve the issues the government has. When there was an issue in the North Central Provincial Council, ministers were removed instantly and new ministers appointed. This could be the issue the President instantly mediated. No commissions, discussions, consultants are necessary to find solutions for their issues. They mediate instantly to consolidate their powers. They mediate to get those in the opposition to their side in one night. Also, there was an issue in the cabinet. Minister Rajitha Senaratna told the media a statement said to have been made by the President. There was a clash stating there was no such statement. A cabinet spokesman was appointed for the President’s faction and the issue was solved. The government that takes instant decision to protect its power does not mediate to solve people’s issues. Mediation to get down vehicles for ministers is very quick. The government that states it has no money to expand universities has enough money to buy vehicles for ministers. Vehicles are bought for ministers every month. Rent is paid for others’ buildings. Hence, the moves of this government are not on behalf of the people. It is a government that uses resources and money of the country to solve their own issues. The government takes instant moves to give Hambanthota Harbour to China, to sell Eastern Jetty in Colombo Harbour, lands to companies and is taking steps to make a future for the super class it represents.